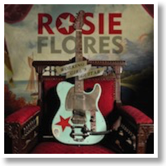 Artist Rosie Flores has had music around her since she was baby. At five she began to sing and was drawn to music by a family that played and sang with verve. In the 1960’s Flores opened for the Turtles band. She also dueted on Rockabilly Filly, which helped jump-start the comebacks of rockabilly legends Janet Martin and Wanda Jackson. Flores has performed from the Rock and Roll Hall of Fame in Cleveland, Ohio, to South by Southwest music conference in Austin, Texas. 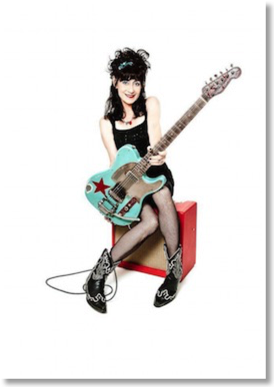 This creative musician has also earned many awards, from a Peabody Award for the narration of the music documentary “Whole Lotta Skakin,” to the L.A. Weekly Music Award for Best Rockabilly Swing Artist. Recently, Rosie Flores has been busy with her music, but Jupiter Index caught up with the high-energy musician for this emailed interview. Rosie Flores: I was a kid of the 50's. I started playing and singing at age 15. I always thought Chuck Berry was cool and my brother played his songs on his little acoustic guitar. I liked the way Chuck sang and moved to his songs and how rhythmic they were. I really wanted to try and play lead guitar so I asked my brother to show me the intro to Johnny B. Goode and he did. What can you say specifically are your musical influences? Early jazz, 60's 70's [R&B] as well as country songs of that era, American pop, and some punk. Can you share which five records have been helpful for your own guitar playing? You have said you enjoy the songs of Townes Van Sandt and Guy Clark, but how do you feel your songwriting differs from theses musicians? My songwriting is perhaps less poetic than these two greats. I've listened a lot to each of these writers because I'm astonished at their simplicity and song craftiness. They write songs that stay with ya both melodically and lyrically. How do you view song writing? Do you feel it’s like a poem or a short movie? Songs are like little plays. There's a character in a slice of life either happy or sad. I feel like I should get writing tonight, I need to write more often than I do. But sometimes I like working on instrumentals and forget the words for a change. Well thanks ! I think it's a bit like acting. But in a song, you only have 3 or 4 minutes to convey a feeling that the song wants the listener to feel. It's challenging but fun to go to a different place or mood in each tune. I love singing Jazz standards for that reason. With all the recording changes that have taken place in the last 50 years, and all the work you have done in the recording studio, what is new that you would like to still try? I'd like to keep recording new stuff with different artists that I Admire. I never got to sing with Willie Nelson or Merle Haggard, that would be cool. I'd love to record with Chrissie Hynde or Paul Mcartney or Keith Richards. I'd like to do more producing for other artists, I'm good at helping people find their groove. Do you have a funny music joke you can share? I consider myself funny and I'm still in the music business! I really appreciate my fans, cause they appreciate me. It's a tough life, I do hear a lot of friends saying to me " I don't know how you do it!" I wear a lot of hats in my career and it can be daunting! So to my fans: You all are keeping my batteries charged and so from the bottom of my heart, I thank you.